Readers, it’s been an interesting week. Whilst Autumn has been starting to show signs of arriving… still light in the morning, but not so much at night, I’ve been cranking the lights on, turning the heating on and pretending I’m in Spain. 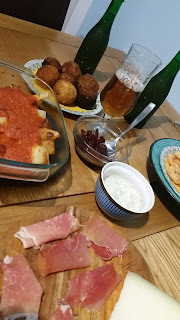 The lovely people at Alhambra got in touch in August asking if I’d be willing to take part in a tapas campaign highlighting the beauty of beer and Spanish tapas dishes. Beer… sold to Mr What Claire Baked. Tapas… sold to the food blogger in the corner. I should probably tell you a little about Alhambra… the brewery is named after the Alhambra palace in Spain and founded in 1925, it’s regarded as the leading craft brewery in Spain. 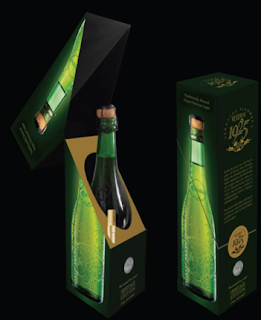 The “Alhambra Reserva 1925” of which I received 12 bottles in a beautiful wooden chest, with some stunning glasses to drink from, is ultra-premium and bottled in a dark green embossed bottled (soon to be holding flowers in our kitchen we liked the bottles so much). I have to confess, at home, I’m not a huge beer drinker, however, in when I’m abroad, there’s nothing better than having a cold beer, on a hot day, sitting on a terrace with friends sharing food and generally enjoying life. My original brief was to create one tapas dish and share the recipe, however, I got so into this task, I’ve created a few different dishes – all of which are easy to create at home. 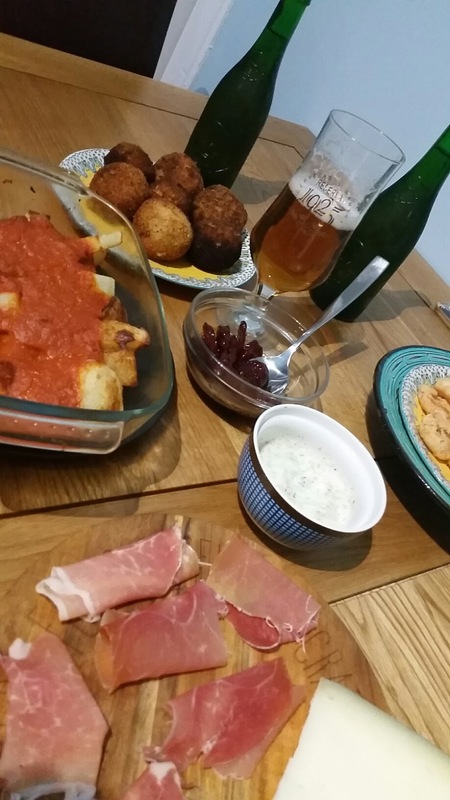 As it’s unlikely you’d have a beer and a one dish, here are some different suggestions to get you thinking about trying tapas for yourself. 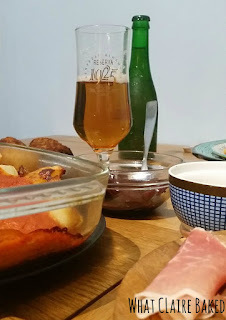 The verdict: this was a great beer to pair with food and to share that with my readers, I’m hosting a competition for you to be in with the chance of winning a heritage set of Alhambra Reserva 1925. Just answer: “What would be your perfect tapa for pairing with Alhambra Reserva 1925? Comment below and you could win a heritage set of Alhambra Reserva 1925 beer to enjoy with your own tapa creations!’ (Entrants must be over 18 and Alhambra will send the prize directly to the chosen winner. Best comment wins. Winner will be announced on the blog). Peel and chop potatoes. Boil over a medium heat on the hob, for around 25 minutes until cooked. 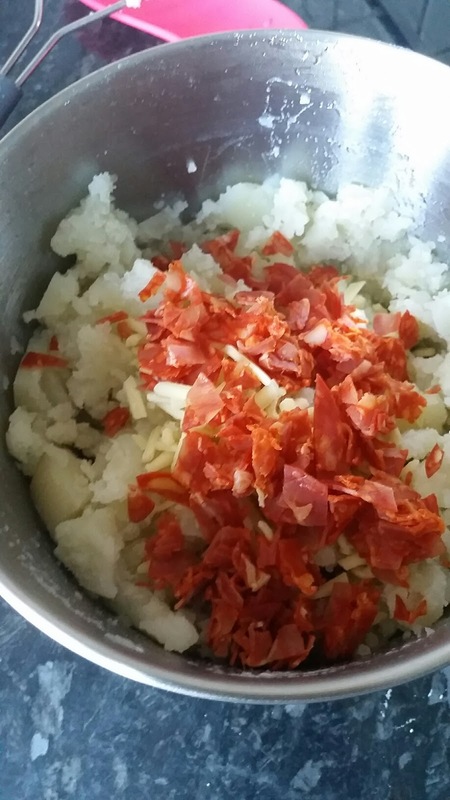 Mash and add chorizo and powdered garlic, mix to combine. Allow to cool. Add salt and pepper to season and mix. 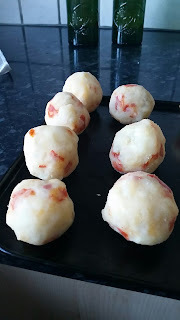 Once cooled, shape into small round balls. Coat with flour, then egg wash (this helps the egg to stick and the breadcrumbs to stick to the egg). Mix the breadcrumbs with herbs and seasoning. 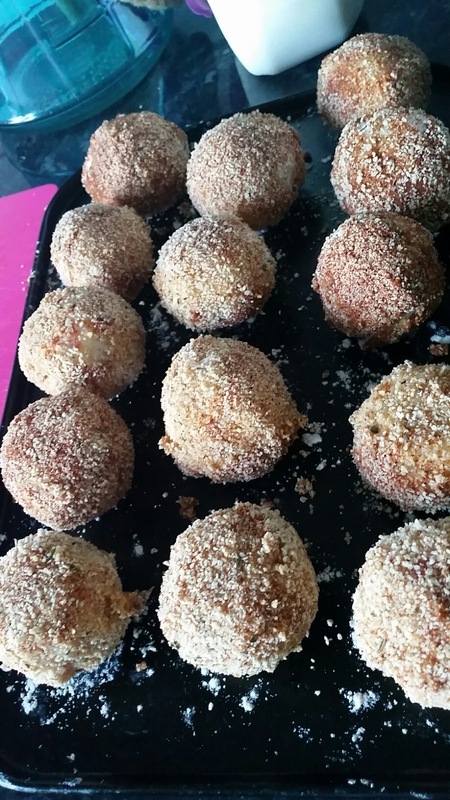 Roll each ball in breadcrumbs and transfer to a fridge/freezer proof tray or plate. Repeat until all mix is used. If you have too many – transfer to a freezer tub and freeze the extras until you need them. Chill the ones you wish to cook in the fridge for 2 hours, or if pushed for time, in the freezer for 1 hour, then transfer back to fridge - you want chilled, not frozen! Heat oil in a large, heavy based pan to 185c (I use a cooking thermometer to check this). Cook 4 at a time for around 4 minutes, or until, golden brown. Remove from oil using a slotted spoon and drain on kitchen roll, to remove any excess oil. Serve immediately with aioli for dipping. Start by creating the batter. Sift cornflour and plain flour into a medium bowl. Make a well in the centre, add the egg, Alhambra Reserva 1925 and whisk from the centre outwards, until just combined. Lumpy batter isn’t a problem! Allow the batter to stand for a few minutes in a cool place. Heat the oil in a deep heavy-bottomed pan until around 185c. Be careful – hot oil is dangerous! 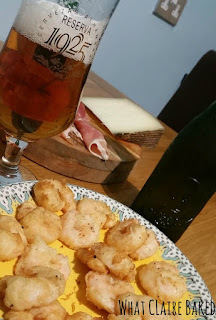 Coat the prawns in flour, then dip the prawns into the batter and carefully add to the hot oil to deep-fry in batches for 2 minutes, or until crisp and golden. Mix the mayonnaise, lime juice and coriander together to form a dip. Serve immediately. Whilst the sauce is cooking, Peel and evenly chop two large baking potatoes. Drop into a pan of salted water and par boil for 10 minutes until tender. 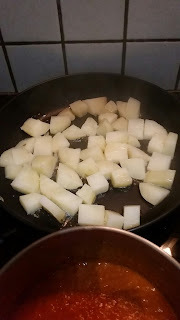 Preheat a frying pan with sunflower oil and shallow fry until potatoes turn golden and are crispy. One sauce has cooked down, put into a blender and blitz until a smooth sauce is created. Pass through a sieve to remove any lumps. Plate up the potatoes, top with sauce and serve immediately. Preheat the pan and fry the garlic for 2-3 minutes. Add the chorizo, red wine and honey. Cook through until the sauce has turned into a thick glaze. Serve immediately. 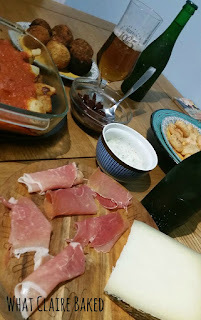 A tapas feast - from Grenada to Glasgow! Disclaimer: Alhambra sent me a series of products to sample and match with food. Any opinions expressed are my own. The beer looks amazing and a perfect match with Tapas....or even without it. 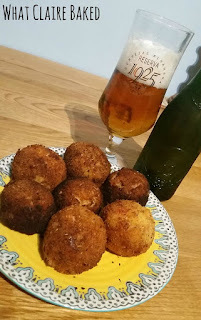 Mini sliders with manchego (I love an ice cold beer & a good burger and this is the tapas equivalent) and Pimientos de Padrón, mostly because I just love them but also because they're so more-ish, deliciously salty and the perfect accompaniment to a good beer. And they have an added element of surprise - most are mild but there's always one that's fiery hot. Another good reason to keep a cold beer handy! Hello! Thanks for your comment. Alhambra have chosen you as the competition winner... Congratulations! Can you email me with your name, email address and delivery address so we can arrange to get your prize sent out? Thanks!